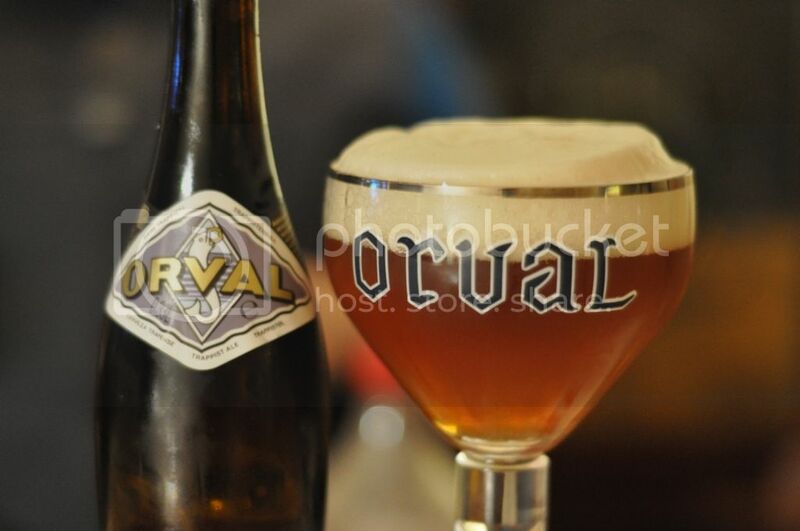 Having recently been given an Orval glass, I thought it was time for me to try the beer. I have enjoyed all of the Trappist and Abbey beers that I have had in the past and when I saw it in the beer shop, I had to have it! So for those who don't, true Trappist beers can only be brewed in Trappist Monastries by the monks. There are only 7 world-wide that currently brew beer and can label in as a Trappist Ale, 6 of which are in Belgium and one in the Netherlands. Most other monastries that brew beer don't adhere to certain non-for-profit laws, and as such are called abbey beers. As this is a Trappist beer, it is bottle conditioned and ages quite well, the flavour gets stronger with age. The one I sampled was just over 11 months old, which is right in the optimum range for this type of ale. Check the age before buying this type of beer, as anything over 30 months after brewing can be quite stale. The beer itself come in a great vase shaped bottle, and pours with this amazing white 2 finger head which lingers for ages. All Belgian breweries make a glass specially designed for their beer to give it the optimum look and aroma, and so having this glass certainly helped with the appearance of the beer. The colour is fantastic, an orange-amber colour with the brilliant dense white head. A great start! When it comes to aroma Belgian beers lead the way, and this beer is no exception. It smells spiced, with a strong cloves smell coming across as well. I also detect hints of fruit, maybe apple or bananas, as well as juniper. There is a fantastic dry malty finish to the aroma, it's smells incredible! This is one of the most complex beers I have ever smelt. After my first taste, just WOW! The head is thick and creamy, the hops hit is spectacular! The distinct citrus hint is also evident. The flavour of this beer is immense, it's almost indescribable. There is also a very tart flavour from the fruits, much stronger than the smell suggested. It's much thinner than the beer looks with very little carbonation. This is a really top of the range beer. In summary this beer is amazing! Most beer drinkers in Australia don't get the opportunity to try this style of beer, but I STRONGLY suggest trying to source one of these. This is the best Trappist beer I have had so far. Definitely worth a try, especially as an after dinner beer as it would be difficult to drink many of these, although it would be incredibly enjoyable. NOTE: Serve at 12-14 degrees as this will greatly enhance the flavour.